Benjamin Blandin, of Charleston, Massachusetts, is a shadowy figure in the history of patented planes. Sure, he was located in a major metropolitan area, Charleston, just across the Charles River from Boston, and certainly had to know of Leonard Bailey, who was plying his trade in Boston during the Blandin's day, but all we know of him is his simple bench plane design for which he received a patent on May 7th, 1867. 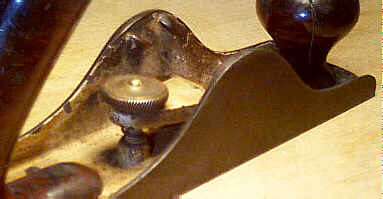 Blandin's patent is almost a direct ripoff of Leonard Bailey's vertical post bench plane design, a design Bailey produced just prior to that design subsequently purchased by The Stanley Rule and Level Co. Both patents rely upon a threaded post, situated vertically just behind and below the iron, and a threaded nut that travels the post. As the nut is turned to the right, the iron's pitch is lowered, which then closes the mouth and reduces its set. Turning the nut to the left has the opposite affect. Haven't we seen this same action before, on other planes? The answer is yes, most definitely. Many of the early bench plane patents did nothing but change the pitch of the iron so that the set and mouth would 'self regulate' proportionately to each other. Louis Rodier did it. Leonard Bailey did it. Leonard Davis did it. And, Benjamin Blandin did it. How could all these guys be granted patents, if they all pretty much did the same thing? I'm no patent lawyer, nor would I want to be, but it seems as though the patent office didn't allow one person to hold the rights to changing the pitch of the iron (afterall, planes had been made for centuries, all with pitches of varying degree), but they did grant patents for the means of changing the pitch. Blandin's design is very simple. It has a loose fiting casting that doubles as a bed and a lever-like arm, the latter of which is drilled to permit the passage of the aforementioned vertical post. On the post, below the 'arm', is a spring to offer some resistance, albeit minimal, to keep the 'arm' pressed upward against the nut. The opposite end of the casting is machined flat, and it's here over which the blade sits. The underside of this portion of the casting is radiused to fit into a corresponding opposite radius in the main casting. It's here were the bed pivots and thrusts itself forward as the nut is turned. The big problem with Blandin's DOA brainchild is that the adjuster is practically useless while the iron is held in place with the lever cap; you can turn the adjusting nut to your heart's content and the iron's pitch will remain constant. To make use of this design, the lever cap screw must be backed off before the pitch can be changed. It should be obvious that this design is sub-optimal and that it was destined to ring up abysmal sales. It didn't disappoint. The sales were few and far between, which makes examples that surface today highly prized by collectors. You may note what appears to be an unsightly scale clinging to the insides of the plane, and not the familiar black japanning that's found on so many other planes. This finish is a white 'japanning' and is original to the tool. A few of the manufacturers sought to differentiate themselves not only with a funky adjustment mechanism but also with bright color as the finish. Some of the early Chaplin's patents and some of Leonard Bailey's Victor line of planes can be found with a bright red paint on the interior. The Blandin's Patent was advertised as being available in sizes #1 to #8, which pretty much correspond to the Bailey sizes. 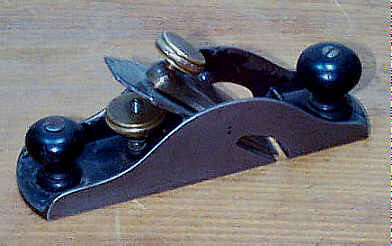 The example in the image here is a #3 size, measuring 8" long with a 1 3/4" wide iron. If you ever find a #1 size of this plane, email me immediately at leach@supertool.com and ask for Patrick. I'll happily trade my wife for it. UPDATE: Since putting an APB out for a Blandin's #1, I finally found one. It cost me a pretty penny as it was sold at a tool auction (I'm happy to say that my wife is still present and accounted for). The Blandin's #1 is a weird little guy. Just look at the image. Note the two turned knobs, one at both ends of the plane. It's perhaps because of the two knobs that sales of his #1 went belly-up. Afterall, how would the average Joe worker know which knob to grip with his front hand and which direction to push the thing? Luckily the iron tells Joe which way to push the plane. This #1 is in a rabbet plane configuration. 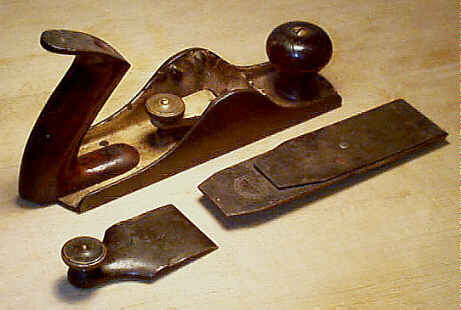 At first glance, one might think that the plane was modified by the owner after it left the manufacturer, but a close inspection of the cheeks, about the rabbet cutouts, reveals the draft, or taper, in the casting. The pattern to make the void in the sand/mold needs a slight amount of draft to it so that when it's removed from the sand it comes out cleanly without 'grabbing' some of the sand thereby ruining the impression in the sand. West Warren, Massachusetts) and that he forgot how to make them when the next order came in, months later than the last one he made. Copyright (c) 1998-2000 by Patrick A. Leach. All Rights Reserved. No part may be reproduced by any means without the express written permission of the author.